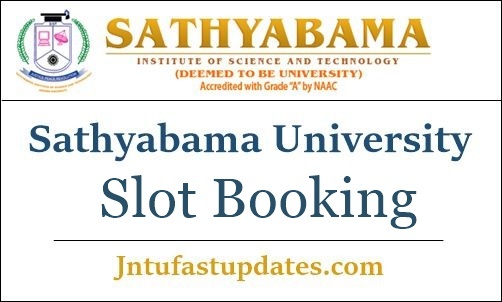 Sathyabama Slot Booking 2019: Sathyabama University is going to conduct the all india entrance test from 12th April to 28th April, 2019. All the aspirants seeking to get admission in Sathyabama university need to book the slot within the scheduled entrance test dates. The slot booking will be commencing from 10th April onwards. Candidates who have applied for admission test can download the hall tickets to attend the test. The hall ticket/admit card is the most required document that needed to attend the examination. Candidates have to download Sathyabama university hall tickets from sathyabamauniversity.ac.in. Before proceeding to the examination, candidates must download and preserve the hall tickets safe to carry to the test. More details about the hall ticket availability date, downloading process, and other details shared in this article. Sathyabama Institute of Science and Technology is one of the well-established universities of Tamil Nadu. The university is situated in Chennai, which is functioning from 1987. The university offers various undergraduate and postgraduate degree courses. Sathyabama University offers various courses such as B.E/B.Tech/B.Arch/BDS/MDS through various affiliated colleges. The university offers education for lakhs of students every year. It offers admissions to students on the basis of their merit. Also, students have to attend the admission test and clear it with good merit to get admission in their desired courses. All the candidates who have applied for the admission test in Sathyabama university can get their admit cards from the official website, sathyabamauniversity.ac.in. Candidates must have to carry the hall tickets without fail while going to the examination. From 10th April the slot booking for admission test will be started and fro 12th to 28th April the entrance test will take place. Search the ‘Sathyabama university entrance test Hall Ticket download’ link in organization website.